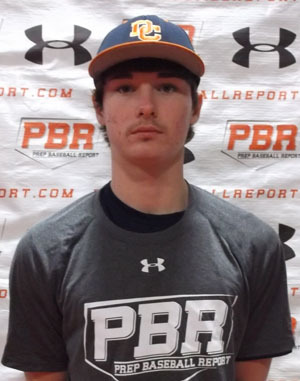 6-foot-4, 170-pound, RHP is a good sized prospect with solid athleticism and quick-twitch muscles, moves quickly through a very up-tempo delivery that tends to jump on the hitter, leg lift is fairly high and gets him very closed, unwinds into an only slightly closed stride that gets him way down the mound before landing, quick arm action is short and comes through a high ¾ slot and has no trouble getting over his front leg. Fastball is very heavy through the zone and can bear down on a righty, slider showed 10/4 shape and can be tight, changeup was thrown for strikes with run and sink. 6-foot-4, 170-pound, RHH hits from a wider and mostly even stance and begins with his hands relaxed near his back armpit, uses a smooth and conventional stride with a slight push back of his hands to get loaded, lower half fires and keeps him pretty well-balanced throughout the swing, bat path is generally pretty flat through the zone but can get steep on pitches down, stayed up the middle at his best, can come around the ball from time to time. Defensively, showed decent hands and above-average footwork in the outfield, played through the ball aggressively, exchange was quick and a little rushed and led to a short but quick arm action through a high ¾ slot.